Stage 20 of the Tour de France was 125 kilometers with over 3,200 meters of climbing. The course, ridden by l'Etape du Tour amateurs the week before, began on the shores of Lake Annecy and finished atop the HC climb, Annecy-Semnoz. Movistar Team's top young rider, Nairo Quintana, took the stage win ahead of Froome and Rodriguez. He claimed the polka-dot jersey and moved into second place overall. Riding with Movistar Team and Quintana was Vuelta a España winner and famous all-rounder, Alejandro Valverde. Below is the Spanish professional's SRM race file illustrating the demands of Stage 20. Stage 19 of the Tour de France, the "Queen Stage", featured five challenging mountain passes over 204.5km. Starting in Bourg d'Oisans at the bottom of Alpe-d'Huez and finishing in Le Grand Bornand. Movistar Team's Rui Costa conquered the terrain and wet conditions for his second mountain stage victory in the 100th Tour de France. Movistar's Nairo Quintana remained third in overall standings and Alejandro Valverde moved up to ninth position after the day's success. SRM race files from the stage are shared by Rui Costa, at approximately 67kg, and Alejandro Valverde, approximately 61kg. 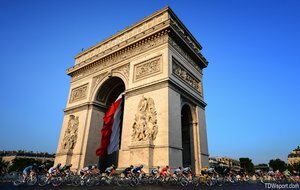 Stage 18 of the 100th Tour de France was a monumental day in cycling history. The 172.5km race began in Gap and finished on the mountain top, Alpe d'Huez. It was the 28th time the Tour de France has featured this notorious HC ascent, but the the first time ever that riders were challenged to climb the 13.8km, 8.1% grade, twice! After the first summit the course followed a technical descent back to the base and looped again up the 21 hairpin turns for a second time with a cool, stormy finish line waiting among the clouds. The unforgettable day was also marked by France earning their first stage victory of the Tour with Christophe Riblon of Ag2r La Mondiale. Riblon won the stage ahead of Tejay van Garderen (BMC Racing Team) and Moreno Moser (Cannondale Pro Cycling) after attacking at the base of the second Alpe d'Huez climb. SRM race files below include Cannondale Pro Cycling's Italian pro, Moreno Moser, who battled for third after taking the KoM on Alpe d'Huez 1 and leading the descent to round 2. The famous German powerhouse Jens Voigt, riding with RadioShack Leopard, also shared a race file from his day driving the breakaway. BMC Racing Team contributed SRM data from their UCI Road World Champion, Philippe Gilbert, for added perspective on the days performances. Stage 17 in the Tour de France was a 32km Individual Time Trial set in the Alps. The start was on the shores of Lake Serre-Ponçon in Embrun featuring two long climbs with a challenging technical descent into Chorges. The stage winner, Christopher Froome, of Team Sky, completed the course in 51:33, followed by Alberto Contador nine seconds back. 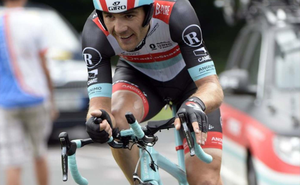 RadioShack Leopard's top finisher for today was Maxime Monfort in 12th followed by Andy Schleck, 15th. Maxime's SRM race file below illustrates the unique demands of a mountain TT and the superior level of fitness Pro Tour riders must achieve to finish the Tour de France.